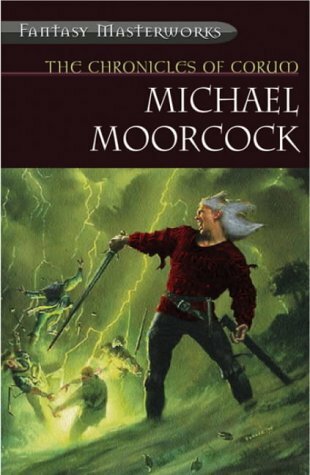 Despite being spread over three slim novels, the plot that drives this trilogy of novels featuring Corum, a maimed incarnation of Michael Moorcock's enduring Multiverse protagonist, the Eternal Champion, is relatively straightforward. Prince Corum Jhaelen Irsei of the Vadhagh leaves the Castle Erorn at the bidding of his father, Prince Khlonskey in search of news of the welfare of the rest of his race in order that the latter may pass into the Chamber of Vapours and die by his own hand in the full knowledge of the fate of his race. Corum has travelled but a little way on his quest before encountering a Mabden horde making haste towards his hereditary home, little knowing that they have already destroyed the majority of his race and are set upon razing his family pile and the inhabitants thereof in a similar manner. Corum is captured byone of the Pony Tribes' leaders, Glandyth-a-Krae and tortured and maimed (losing his left hand and right eye) prior to being saved by an aspect of Lord Arkyn, Lord of Law. At this point, the focus of the narrative broadens and the motive force behind the Mabden's destructive campaign is revealed as being the manifestation of a realignment of the balance of Law and Chaos within the Fifteen Planes as the latter begins to best the former. Furnished with the arcane powers of the Hand of Kwll and Eye of Rhynn allowing him to summon emissaries from other planes, Corum is tasked with overthrowing Arioch, the Prince of the Swords, Xiombard, the Queen of the Swords, and finally Mabelode, the King of the Swords. The purity of Corum's quest to avenge his family and race - seldom a pure motive - is debased in his own mind by the acts that he is compelled to undertake, and the innocents slain by the godly appendages that have been grafted on to him by his patron: "Too many crimes have been committed so that that vengeance might be won! Too many unfortunates have suffered frightful fates! Will the Vadhagh name be recalled with love - or muttered in hatred?" (p. 128). Standing apart from the forces of both Law and Chaos is the Nameless Force (p. 265), possibly a supreme being of some order who has set the forces of a Cosmic Balance in sway, and yet who seems to have no control over it - or perhaps no desire to control it. It is a moot point whether the contemplation of balance and the consquences of its disruption denude the series of suspense, or augment it. I tend to favour the latter as a function of the struggle of the protagonists rather than the mechanical pre-ordained destinies of the elect, but it is far from taxing to construct a reading wherein the former is encapsulated by the latter.